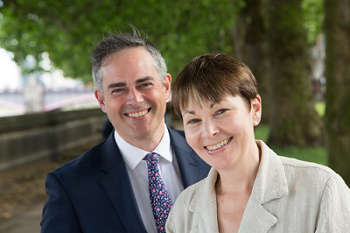 The Green Party has pledged to create ‘a people’s transport system’ that makes it easy for people to choose to leave the car at home – ‘or not have one at all’. In its general election manifesto, called a ‘green guarantee’, the party says that if elected it ‘will work to increase public investment in the railways, trams, ferries and buses, as well as to make our streets and roads safer for everyone’. Launching the document, co-leader Jonathan Bartley said the party was ‘creating a resilient, diverse and people powered economy that allows us all to live larger lives and cope with the challenges ahead’. The party wants to return railways to public ownership, re-regulate buses and invest in increased bus services, especially in rural and other poorly served areas. It also says it will invest in regional rail links and electrification of existing rail lines, especially in the South West and North of England, ‘rather than wasting money on HS2 and the national major roads programme’. The party would also cancel all airport expansion and end subsidies on airline fuel. It would however ‘invest in low traffic neighbourhoods and safe, convenient networks of routes for walking and cycling, including safe places for learning to cycle’. The manifesto says all public transport should be fully accessible and step-free and proposes a phase-in of free local public transport for young people, students, people with disabilities, and older people. The party is also pledging to ‘end the public health crisis caused by air pollution by increasing incentives to take diesel vehicles off the roads’.